When ITER enters operation, orders originating in the control room for the electrical networks will be processed in "E-houses," where dozens of instrumentation and control (I&C) cubicles will relay them to the switchyard's high voltage components. The E-house for the steady-state electrical network (SSEN) is already in place within the confines of the 400 kV switchyard situated at the southwest end of the ITER platform. 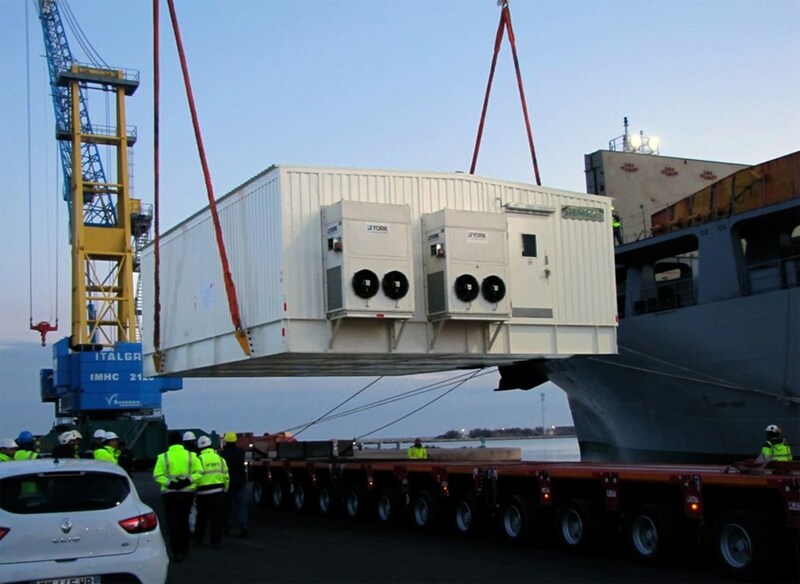 Counterparts for the pulsed power electrical network (PPEN)—procured by China—were unloaded last week in Fos-sur-Mer and are scheduled for delivery to the ITER site on 9 February. One E-house is for the 400kV switchyard which connects to the French grid; the other is for the 66 kV switchyard that powers magnet power supplies and part of the plasma heating systems. Similar in look to windowless mobile homes, the PPEN E-houses are comparable in size to a three-room apartment and come fully equipped with HVAC, control panels, cabling and switchgear. Weighing respectively 50 and 60 tonnes, the two loads are among the widest that will be delivered to ITER.